Your kitchen reflects your lifestyle. Our professional team can help you reimagine the most important space in your home. 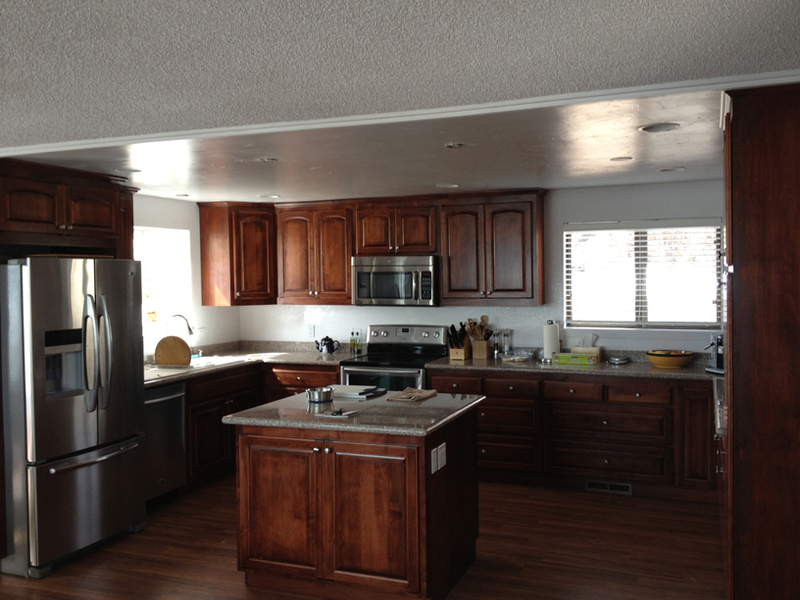 Specializing in granite countertop installation, we provide quality, efficient work at competitive prices. Whether you want a sleek, modern remodel or more of mountain rustic look, we have the vision and expertise to design exactly what you’re looking for. We build decks that endure the weather here in the Sierras and surrounding areas. Our designs are constructed to last for decades. Our experienced team builds beautiful, durable staircases for homes of all sizes. Call for a quote on your customer staircase. We build from the ground up! Call us for a quote and we can see how Gold Spike Construction can make your vision a reality. Sheds get a bad rap when it comes to their curb appeal, but our team at Gold Spike Construction thinks a good looking shed can influence what you decide to store in it. Building a shed requires thorough planning and pristine craftsmanship. With our team, your shed will be sturdy and nice to look at. There’s no in between with tile: it either looks so-so or it transforms your home. Gold Spike Construction has the steady hand and experience with customer design to provide beautiful tile work you can enjoy for years to come. Whether you like stone flooring or bamboo flooring, our team is uniquely qualified to install customer flooring t match the style of your home. With superior craftsmanship and the highest quality materials, our team installs durable, stylish cabinets and drawers for new or remodeled homes. Whether you need to create more space for your ski stuff or you’ve got plenty of space that could be used for extra storage, we partner with you to design closet spaces that work for your lifestyle. Is a house really a home without a fireplace? If you live in Minden, Gardnerville, Reno, Truckee, Carson City, or South Lake Tahoe your fireplace one of the main gathering spots in your home. It’s also a main focal point. Specializing in custom mantle designs, our craftsmanship is clear in every tile, stone and brick we set. Our owner, Michael Dennis has over 29 years experience in all phases of construction. The work we do exceeds the standard. Whether you’re looking for masterful stone and tile work for your fireplace mantle, seamless installation of bamboo flooring or a new design from the ground up, Gold Spike Construction builds your dream space. Every project we work on has its own personality and mark of exceptional quality. We are able to do great work because we work closely with our clients—we listen, consult and build based on the specific needs of the client. This results in original and authentic work that is true to our client’s vision. Whether you have a vague idea of what you want or you’ve been drawing up blueprints and sketches for years, we work with you to create a home that matches your lifestyle. We are located in Minden and serve South Lake Tahoe, Incline Village, Tahoe City, Kirkwood, Truckee, Markleeville, Donner Lake, Minden, Carson City, and Gardenerville areas. © Copyright 2019 Gold Spike Construction. All rights reserved.